A big hello from the new editor of Wildlife Film News! Thanks to Ciara Backwell for her brief stint as editor and very enthusiastic greetings to you all from me, Jason Peters, as I take on the role of editor of this fantastic resource for wildlife film makers all around the world! I am thrilled to be involved and am excited at the prospect of helping out my fellow film-makers by keeping them up-to-date with all the latest industry news! I'm also the Research Co-ordinator for the "Films that Make a Difference" database - An expanding online library of conservation films, and we are ever keen to find more qualifying films for that, so please do take a look at the website and either alert us to your films or pass on your knowledge! You can continue to send your news items for Wildlife Film News to myself at the usual address of info@wildlife-film.com... I'll look forward to hearing all about your wildlife-film-related news... Also, if you've any suggestions about how to improve the newsletter or website, do drop me a line, & please, don't be shy! Wildeye have a few places left on their Research and Production course in Norfolk UK on 16-18 Sep 2011. This will be the last of these courses until well into 2012. Research and production are essential elements of the wildlife film industry but the activities involved and techniques required are not always obvious. This course combines presentations from experienced researchers and producers, who can guide you through the pitfalls and teach you the tricks of the trade, with practical work and examples from real productions. Working as a wildlife researcher or production assistant is often the first step in the wildlife film-making industry but getting a job can be hard. This course will give you a thorough grounding to all the skills required and be a valuable addition to your CV. If you are planning on 'going on your own' as a researcher/producer the information gained from this course will be invaluable. The skills learned are applicable to team members or solo film-makers. If you have a camcorder that has now been superseded, and you no longer use, then we would like to offer it a good retirement home at The International School of Wildlife Film-making! We are always in need of extra cameras that the students can use during practical work. Many of those starting out have no kit to practice with. If it is in working order and in the UK and you would like to donate it to the school we would love to hear from you. Better to recycle than leave in a cupboard ... We will of course pay postage costs. Please contact us with the model details etc at: info@wildeye.co.uk Many Thanks! The late deadline for entries is August the 15th 2011... Last chance to get those entries sent in! Entries may relate to environmental issues, cultures, native and indigenous peoples, land use, water, socio-political issues, outdoor recreation, hunting and conservation, climate change, energy and in general, the world around us and our place within it. Films entered may be features or documentaries, shorts or long form; professional, amateur or student made. They may be from any production year. The film festival will take place in Misoula Montana between the 17th-23rd October 2011. Please email jr1@wildlifefilms.org if you have any questions. The largest film festival of its kind in the United States, The Wild & Scenic Film Festival seeks unique environmental and adventure films that aim to inspire and educate. In 2010, the festival received over 350 entries for a final official selection of approximately 115 films. The Wild & Scenic then travels to over 115 locations in the US and internationally. The “on tour” program gives filmmakers a wonderful opportunity for worldwide exposure. The Wild & Scenic Film Festival announces their annual Call for Entries, open now through the submission deadline, September 30, 2011. The tenth annual festival takes place January 13-15, 2012, in historic Nevada City, CA. For film entries and/or further information please contact lori@syrcl.org. Filmmakers for Conservation (FFC) is an internationally recognised voice for publicising conservation issues and supporting sustainability in filmmaking and conservation filmmakers. After 11 years of successful operation, the FFC Board is pleased to release its new FFC Strategic Plan 2011-2014, which will guide improved performance and tangible outcomes for members. 1. FFC to be a world-leading centre for excellence in conservation media and a global community for those using film and media to communicate the importance of conserving the natural world, peoples and cultures. 2. The Strategic Plan from 2011-2014 includes developing a business plan, a financial plan, a communications strategy and organisational management plans. 3. It also includes a fundraising strategy with an objective to improve support for conservation filmmaking into the future. 4. Funds received by FFC will serve the following key purposes: To service organisational administration and running costs currently partially covered by existing funds from membership/corporate annual fees; Creation of a part-time operational position with budget and deliverables to meet the Strategic Plan objectives; Develop and implement a micro-grants and awards program to support FFC members and conservation filmmaking. Board Members will be present at the Jackson Hole Film Festival, October 2011 in the US where the Board will hold its Annual General Meeting and welcome questions from members regarding the new Strategic Plan and other FFC matters. Email enquiries: paulm@filmmakersforconservation.org. Find out more here here. The BBC NHU, headed by Andrew Jackson, have produced an impressive showreel for 2011! Kim Shillingshaw, the BBC's Commissioning Editor for Science & Natural History, explains what she is looking for and assures us that the BBC will be making natural history films for many years to come. "There is a wealth of Natural History programming across the BBC: from our Epic landmark series that tell ambitious stories on a scale unrivalled by any other broadcaster – programmes like the upcoming BBC One series Frozen Planet, Africa and Survival; to our more Intimate shows that dive deeper into the natural world – recent commissions include Chris Packham's How Life Works and Monty Halls' exploration of the Great Barrier Reef, or BBC Two stalwarts like Springwatch, Autumnwatch and the long-running Natural World strand." The News & Documentary Emmy® Awards will be presented on Monday, September 26 in New York. Chiang Mai, Thailand - Starting September 1st, 2011, Save Elephant Foundation will be offering a range of new, exciting wildlife filmmaking and video journalism programs. All workshops include 100% hands on instruction from professional film-makers with over twenty years production industry experience. The proceeds from these workshops will go directly to protecting Thailand’s beleaguered elephant population. At the Elephant Nature Park in Thailand’s awe-inspiring Mae Tang Valley, students will find the perfect environment to develop their filmmaking skills. The Park is home to over thirty rescued elephants roaming free and living naturally, much as they would in the wild. Full time staff and international volunteers attend to their daily needs, as most of the herd has injuries from abuse endured during their working lives. Each animal has an emotional story to be told. The Save Elephant Foundation Wildlife Filmmaking Program will use a full range of state of the art HD cameras and broadcast production equipment, along with a fully equipped editing suite. The program will include several course options: • 2 Day Basic Shooting Workshop • 4 Day Advanced Shooting Workshop (includes recording broadcast quality audio) • 3 Day Professional Editing Workshop • 1 Day Business of Filmmaking Seminar • 9 Day Professional Video Journalist Class - This full course will show aspiring filmmakers how to write their own script and produce a short documentary, which will be uploaded to YouTube and burned to DVD. Students will receive official certification upon completion. More information on the Save Elephant Foundation and their Wildlife Filmmaking Workshops, as well as online course registration, is available at: www.saveelephant.org. Earth-Touch has an impressive new stock footage library bursting with over a thousand hours of prime HD material. Our archive is exclusively full HD, with acquisition formats of HDcam and DVCPro HD. Whether you are searching for terrestrial or marine clips , simple fillers or scene-setting panoramas, the Earth-Touch archive has exceptional footage from around the globe filmed by some of the world's best cameramen. From Antarctica's king penguins to the zebras of Zambia, all our clips are filmed in stunning HD. Don't forget to catch our monthly update showcasing fresh additions to our outstanding new archive. It's countdown to WildPhotos 2011... An extraordinary gathering of the world's leading wildlife and environmental photographers, providing a unique mix of photography knowledge, art and inspiration. Taking place on Friday 21 and Saturday 22 October 2011 at the Royal Geographical Society, London, WildPhotos 2011 is the UK’s largest nature photography symposium. Breaking with tradition, WildPhotos 2011 welcomes two compères this year. Chris Packham, TV presenter, photographer and author returns as compère for Saturday's sessions; with Mark Carwardine, zoologist, active conservationist, award-winning writer, TV and radio presenter and widely published wildlife photographer, opening the first day of sessions as Friday's compère. We are delighted to announce our keynote speaker for Friday 21 October – world-renowned and celebrated American landscape photographer Jack Dykinga. A Pulitzer Prize winner, Jack Dykinga fuses a photojournalistic, documentary approach with large-format landscape photography, to promote a focus on environmental issues through his work. Prepare to be moved by Dykinga’s keynote session ‘The Power of Images – from Damnation to Celebration’ and learn how photography can ultimately change our intrinsic values. Once again, we offer delegates a breathtaking line-up of the world's finest wildlife and environmental photographers and industry experts, including winners from the prestigious Veolia Environnement Wildlife Photographer of the Year competition. The AR-4i is an audio interface for iPhone 4 (and iPod Touch) that allows the iPhone to sit in a handheld dock whilst shooting video or just making audio recordings. The high quality stereo microphone inputs use their own A/D converter to improve the audio quality over the iPhone 4's standard capabilities. The result can be recorded and/or streamed live via Ustream, LiveStream or similar live video enabled social sites. Of course if no video is required it can still be used to stream or record the audio only content. 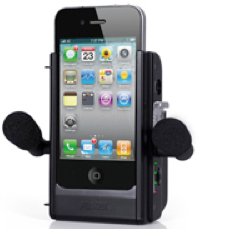 The AR-4i is the ideal accessory for any iPhone 4 or iPod Touch owner wanting to make high quality recordings and broadcasts of music, sports or any other live event. 2 x cardioid plug-in microphones come as standard. Third-party microphones can also be used. 2 x AAA batteries for more than 10 hours operation. External power can be fed via USB Ergonomic design for secure holding. Screw hole provided for optional camera gears such as tripod, grip etc. Olympus LS-3 Linear PCM Recorder: The smallest device to capture the purest, better-than-CD-quality sound... Professional sound for anyone, anywhere! It’s just what users have been waiting for - Highest quality audio recording matched with a pocket-sized format. The easy-to-use Olympus LS-3 joins the coveted family of LS audio recorders, sharing the awe-inspiring studio-grade sound capture capabilities in 96kHz/24bit Linear PCM format. It comes hot on the heels of the legendary LS-11 model but at approximately half the size and weight. And offers a surprising extra: a Pre-Record Buffer that captures several seconds of audio before the record button is pressed. This means that the vital start of a song, chirping of a bird or whatever is being recorded need never again be missed. Joining its two angled condenser microphones is an omni-directional mic, which improves the capture of low frequencies for truly natural stereo with expansive bass feeling. And enhancing sound purity in situations with background sounds is a switchable two-level low-cut filter. The producers do not recommend or endorse any particular method, institution, product, treatment, or theory. Opinions expressed in Wildlife Film News are not necessarily those of the producers.